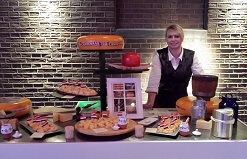 At least 4 delicious Dutch cheeses. Most of the time 4 to 7 different ones. 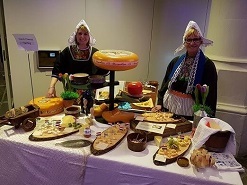 For example, a North Holland cheese, which is influenced by the climate and the land reclaimed under the strong influence of the sea, making the North Holland pastures rich milk. 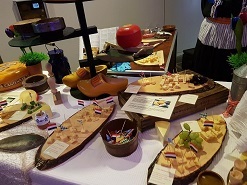 On the table we have typical Dutch items a wooden shoes, tulips and lost of decoration. Staff can be dressed in Volendam costume, costume Dienstmeid 1900/1920 design, but also in black trousers, white shirt and burgundy apron. 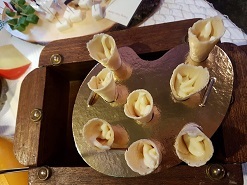 "The guests had a brilliant time last week and we were very happy with the cheese ladies - will be sure to use them again, the spicy ones did indeed go down well with the public that was there." "Very nice! The whole experience, with decoration and outfits, was very nice. Precisely because we had many international guests, this was very well received. � Communication with the office was good, easily accessible and very clear in the communication." 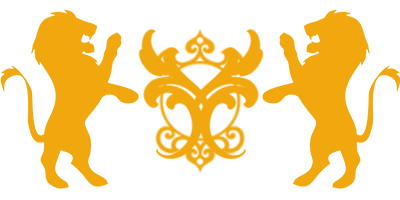 � "It looked nice, professional and delicious." Genever is a traditional Dutch distillates made from cereals, juniper and other herbs. The famous Dutch gin brand Bols export to as many as 110 countries. In the Netherlands gin with a share of over 20% is still the top-selling spirits. This means that the Dutch consume less than 17 million liters of gin per year. Unique in our tasting is'Pikketanissie' an exceptional young genever out of the Jordaan district in Amsterdam. 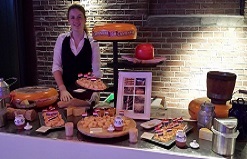 Our tasting is combined with 4 delicious Dutch cheeses. Your booth or table is tastefully decorated. 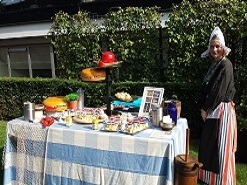 Cheese cubes will be cut and gin is poured by 2 girls dressed in Peasant Costume or maid dress from 1900/1920, handmade. Excluding 21% VAT. Including 250 plastic glasses and Gin.